Aside from a few really useful assets from the Unity store (rope bridges, Tiled map importing, and the free standard 2D assets that come with Unity as a code base), it’s not all built-in or pre-made given the things we wanted to accomplish with the game. So far I’ve found myself adding double jump, drop-through platforms (jump-through is built-in thankfully), as well as a simple custom-parallax solution. The biggest stumbling block has been figuring out how to convert a frame-based system of animation used in C2, to the time-based system of animation in Unity (as Unity also animates values, 3D models, etc). But that’s not too bad, since finding out how Unity likes to do things is fairly easy with all the helpful documentation online and other forum resources. Chris has been tweaking the animation to match it up to the prototype as we go along. Chris has kept plugging away at the design side of the game and with his light-speed drawing and animation work based on the cool ideas that keep flowing from Maddi’s brainstorming sessions! But since he’s super-human he’ll also be dipping into the Unity build from time to time to make sure it has that special layer of polish that the prototype was brimming with. Speaking of native, Chris did some testing so far and we are already seeing massive performance improvements i.e. full speed on low-end devices that completely dropped the ball on the HTML5 prototype before as well as out first game, Insanity’s Blade. 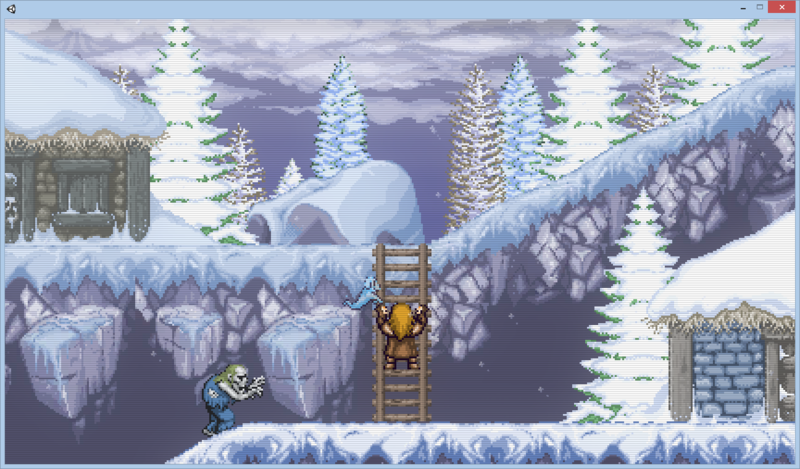 At this point we should be able to have a the first winter stage up and running in the next couple of weeks, matching the version built within the prototype. And that’s all I have to say about that! … Also the image of the game running in Unity above? Yup! Scanlines, bloom, and particles confirmed. After all of the issues we’ve had with the C2 version of the prototype, this one is already shaping up to be a dream come true! We can’t wait to share some video of the Unity Build with you in the upcoming weeks! !